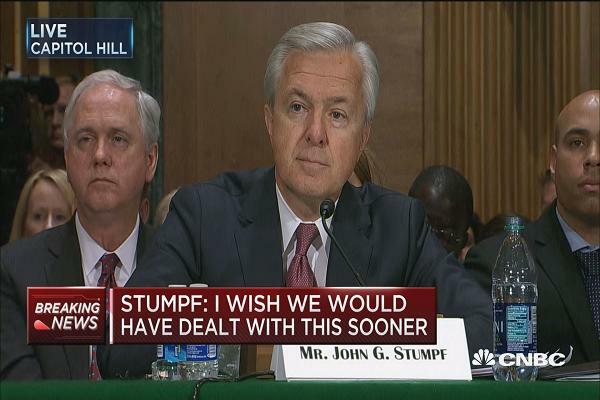 By now you’ve probably seen Wells Fargo CEO John Stumpf on TV being pummeled by Senator Elizabeth Warren and others. He is this fall’s corporate pinata. Actually, what’s happening now reminds me of this scene from Airplane. He is an easy target. Senators and congressmen are lined up to take a shot. Stumpf’s had more money than I’ll make in a lifetime removed from his compensation and more public shaming and ridicule than anyone should endure. It’s not enough. Not even close. The big boss sends an edict from above which just can’t be accomplished with current staffing. So, people work off-the-clock or fudge part of the job or in Wells Fargo’s case, cheat, lie and steal. Wells Fargo’s staff was driven hard to make what many felt were unreasonable goals. Failure to perform might get you canned. The people who committed these crimes should be punished — but so should those who relentlessly drove them to do it! Stumpf is the responsible party for these crimes. He should be tried on criminal charges. We need to see more senior management held accountable. Everyone wants credit when it goes their way then hides when it doesn’t. Well said…..and I want to be on the jury! I hate to dissapoint you but, it all smoke and mirrors. Nothing will happen to him. he may lose his job but, that’s little conciquence for a guy in his position. He’s got millions of unknow money here and there to last him a life time. I China they just take them out ans shoot them. But, we’re civilized here. He’ll just eventually retire and work for Electric Boat or Sikorsky as President or CEO. These guys are never touched. I’ll really be surprised after all it done that he’s just shammed and then goes on with his career. Previous Previous post: Why The Delay?